I’m planning on creating some DIY sensors and switches across my house (more on that in future posts!) and was looking for a good way to communicate over WiFi with them from Home Assistant. If you’ve never heard of MQTT it is described as a “publish-subscribe-based messaging protocol that works on top of TCP/IP”. It works especially well in small code footprint areas like microcontrollers. It is commonly used for this type of application and I decided to go with it for my home automation projects. Below is a data flowchart for what I’m wanting to eventually get to. My DIY sensors will publish and subscribe to separate MQTT “topics”. When the value of their state changes they push that data to the topic which Home Assistant subscribes to. Home Assistant reads the data from the topic and displays it in the UI. The data can work the other way too when a user activates a switch in the Home Assistant UI (or via an automation) it publishes to an MQTT topic that an DIY IoT switch subscribes to. 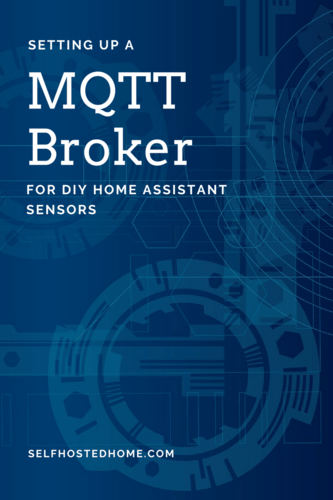 Essentially, the MQTT broker enables two way messaging between any connected devices and my Home Assistant installation. MQTT uses a “broker” for the communication. In practice, this means that all the clients do not need to know about each other, they just pass messages around on the various “topics” listed on the broker. version: "3" services: homeassistant: image: homeassistant/raspberrypi3-homeassistant:0.68.1 volumes: - /home/pi/home-assistant-config/configuration:/config - /etc/localtime:/etc/localtime:ro network_mode: "host" ports: - "8123:8123" devices: - "/dev/ttyACM0:/dev/zwave:rmw" depends_on: - mosquitto mosquitto: image: leojrfs/mosquitto-arm:latest volumes: - /var/mosquitto/data:/mosquitto/data - /var/mosquitto/log:/mosquitto/log - ./mosquitto.conf:/mosquitto/config/mosquitto.conf network_mode: "host" ports: - "1883:1883" - "9001:9001"
A configuration file mosquitto.conf should be present in the same directory as the docker-compose.yml file. This file is mounted into the container in the config directory. The /var/mosquitto/data and /var/mosquitto/log directories need to be created on the docker host for mosquitto to store its data and logs. Now create the directories needed for Mosquitto. Note that we need to set them to 777 permissions because the user within the docker container will have a different UID but still needs access to writing to these directories. Now that the broker should be running we can test it out by subscribing and publishing to a topic. From my development machine, I installed the mosquitto package to get the publish and subscribe clients available. Check the mosquitto docs for more information on how to install it on your platform. Next, start subscribing to a topic by using the mosquitto_sub command. mosquitto_sub -h ha.local -v -t "home-assistant/#"
Make sure to change the hostname from ha.local to whatever the host is running your MQTT broker. This starts a process that subscribes to the topic and waits for new data. Now, open up a second terminal for a new process and run the publisher using the mosquitto_pub command. mosquitto_pub -h ha.local -t home-assistant/switch/1/on -m "Switch is ON"
(Again make sure to change the hostname to match your system). You should see the message pop up in the subscriber terminal. If so, your MQTT broker is up and running! Make sure to change localhost to the hostname running your MQTT broker if you didn’t run it on the same machine. Reboot Home Assistant after making that change and if no errors pop up in the Home Assistant UI it should be working correctly.